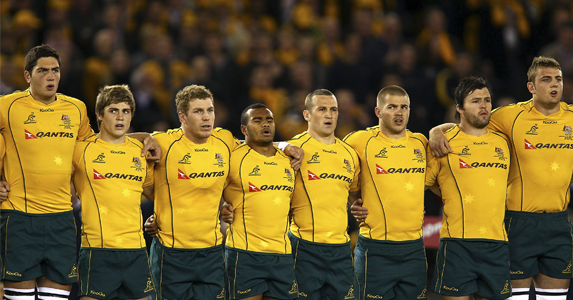 Australia were distraught after their ignominious World Cup exit in 2007. Can this skilful bunch make amends? Australia’s 2007 World Cup experience was akin to inflating a beautiful balloon. Initial hard work produced great results and the outcome looked more and more promising until – BANG! Suddenly it was all over and Australia had nothing to show for all their efforts. The Wallabies cruised through their pool, beating Japan, Wales, Fiji and Canada with a combined points total of 215 for and just 41 against. Next up were an England side hopelessly out of sorts. The Aussies were confident of avenging their RWC 2003 final defeat, with their players, officials and media all lashing out at England’s “Dad’s Army” of a team. But England destroyed their pack to win 12-10 and send the Wallabies home at the quarter-final stage for only the second time. So can Australia avoid a repeat of the nightmare of 2007? Well, they have a new coach and new players, and the first major obstacles in their way are their main rivals in Pool C. As Australia play Italy and Ireland in their first two matches, they will need to hit the ground running. The schedule means their fate will be determined before they meet the USA on 23 September and World Cup Finals debutants Russia on 1 October. Australia have never met Italy at a World Cup but have clashed with Ireland in three tournaments and a glance at those results, and at Ireland’s performance in beating England during this year’s Six Nations, show they will not be in for an easy ride. In the 1991 quarter-finals Australia squeaked past Ireland 19-18 in Dublin. Eight years later they met at the same venue, this time in a pool match, and Australia won 23-3. It was far more nail-biting in their 2003 pool clash as Ireland were edged out 17-16 in Melbourne. Ireland haven’t beaten Australia since November 2006, but the sides drew 20-20 in Dublin in November 2009 and when Ireland toured Australia in June last year they lost narrowly, 22-15 in Brisbane. Australia have won all 13 of their previous clashes with Italy, so the prospect of meeting them first up shouldn’t worry them and, with their Tri-Nations fixtures only finishing on 27 August, they will be match fit. However, they need to bear in mind Italy’s outstanding win over France during the Six Nations. They don’t want a repeat of the complacency that afflicted them in that 2007 quarter-final. Australia’s chance of success at this World Cup boils down to a few key factors. First, can the brilliant young players unearthed by Robbie Deans in the past three years stand up to the pressures of performing on the biggest stage? After struggling in the 2009 and 2010 Tri-Nations, the potential of this team began to truly emerge with excellent wins over New Zealand and France last autumn. The likes of James O’Connor, Kurtley Beale and David Pocock are rare talents – Beale and Pocock both nominated for IRB Player of the Year in 2010. The scrum – again! – will be key as opponents still see that as a weak link. It’s rare that a team who are backpedalling in a scrum can win a Test, although Australia have the backs to fare better than most would under such pressure. Finally, Australia must learn the lessons of four years ago and ensure they don’t take opponents lightly. Before that quarter-final in 2007, Lote Tuqiri said Jason Robinson was the only world-class back in England’s team, ARU chief John O’Neill insisted that all Aussies hated the English, and Wallaby legend David Campese claimed it would be the worst thing for rugby if England went through. England were duly wound up and enjoyed the last laugh. It’s now 12 years since Australia won the World Cup, so they need to keep their heads down and their mouths shut until the deed is done. Can they beat the All Blacks at the World Cup?